Although the national divorce rate in the United States is slowly decreasing, the reality is that there is still a significant number of couples divorcing. According to the CDC’s most recently published data, over 800,000 couples were divorced in the United States in 2015. With divorce comes service of process, typically hand delivered by a civil process server. Technology, however, is changing that. While e-service was once primarily limited to email, it has expanded to include social media sites, such as Twitter and Facebook, which you can see in our last report: The History of E-Service. The first report of service via social media in a divorce case, Mpafe v. Mpafe, occurred in 2011. The plaintiff had not seen her husband in a year, and service by traditional means of publication had been deemed antiquated and prohibitively expensive. Service by social media was authorized as an alternative means of service by publication. More recently in 2015, service by Facebook was again granted in a divorce proceeding with Baidoo v. Blood-Dzraku also as a method of alternative service, which would have a higher probability of reaching the defendant than traditional publication. The plaintiff had not seen her husband in a year, and service by traditional means of publication had been deemed antiquated and prohibitively expensive. Service by social media was authorized as an alternative means of service. As requests for e-service by social media becomes more prevalent, especially in divorce proceedings, we are examining the efficacy of effectuating service of process via Facebook and whether or not it should be deemed legally acceptable throughout the United States as a method of substitute service. Typically, traditional service of process requires that a process server be someone who is at least 18 years old and who can sign a service affidavit, and they must not be a party to the case. The documents are hand delivered to the recipient and delivery confirmation is a legally affirmed via a service affidavit. Because the individual is served in person, physical identification and even verbal identification can be made. While the formal rules and regulations of civil process service vary from state to state, these requirements of service are fairly standard because it helps to ensure due process — that the documents are being handled by an adult, that there is no conflict of interest when it comes to delivering the documents, the right individual is being served, and that there is proof that the documents were received. Service by social media, such as Facebook, would essentially deliver electronic copies of the documents via the private messenger application extension of the social media site. With Facebook, users are notified when they receive a message. The sender can also view whether or not the recipient has received the message and whether or not the message was open and viewed. The individual sending the service would be doing so electronically, so it could come from a process server or a law office. There are currently no regulations on the books as to who can serve process electronically; eservice cases to date have relied on the rules of traditional service. Service can be effectuated expeditiously, cheaply, and with confirmation, which is perfect in situations like divorce when both parties are interested in a quick and efficient resolution. 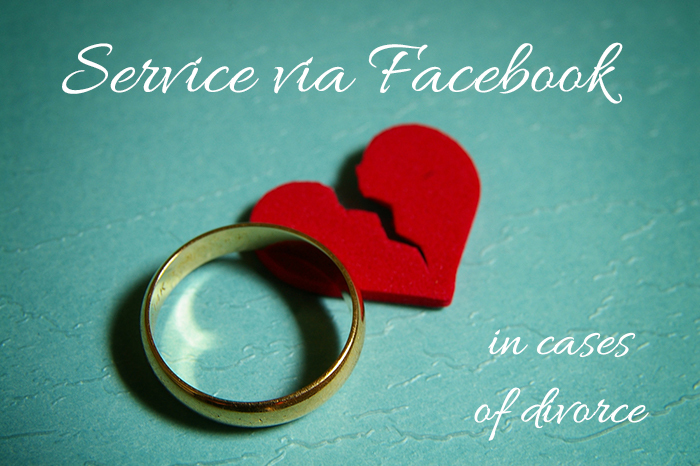 Service can be effectuated expeditiously, cheaply, and with confirmation, which is perfect in situations like divorce when both parties are interested in a quick and efficient resolution — and when they are expecting the service by social media. Conversely, in situations where parties to be served have been elusive, service by social media may still be the answer. If a party knows the real identity of a social media profile, and the respondent has been dodging service by traditional means, why not use social media to effectuate service? Well, despite the fact that service by social media is seemingly straightforward, this type of service can be problematic. In order to serve process, whoever is sending the documents needs to confirm and verify the identity of the individual being served. The information publicly available on social media accounts varies, but there is typically a picture (or pictures) of the individual and the user’s current city of residence. However, some individuals choose to have an image of a pet, a car, or even an image of text or something else that isn’t a portrait. In cases of divorce, however, it is extremely likely that the profile could be accurately identified by the spouse and based on their mutual friends. While some individuals even have status updates and conversations publicly available, others may have their profiles secure, with comments, pictures, and conversations only privately accessible. In divorce, the two parties may have their accounts connected (e.g. Facebook friends, Twitter followers), and mutual “friends” may be shared, providing further confirmation that the correct profile of the party to be served has been found. Some users choose to publicly divulge more information, such as workplace, education information, relationship status, and even previous locations where the user has resided — all of which aids in confirming the identity of the individual. But all of that depends on the user’s privacy settings. In the aforementioned divorce case, Baidoo v Blood Dzraku, in which service via social media was granted, the plaintiff was still required to attempt to contact the defendant to provide back-up notification. While all of this is compelling information with regard to confirming the identity of the individual, there are still instances in which an individual’s identity is used and a fraudulent online profile is created. Often, this false profile is used in online dating (catfishing) and other clandestine affairs. While the existence of this phenomenon casts some doubt on the authenticity of the social media profile, these instances usually occur when a stranger is running a romantic or financial scam, and it’s unlikely that this would happen during a divorce proceeding. Provided the server found the correct individual, the issue remains that it cannot be proved that the individual saw the message and that they were the person who opened it, if, in fact, it was opened. Because social media accounts are only secured with a username and password, they are not federally protected from being accessed by another individual, such is the case with the U.S. Postal Service. Similarly, message delivery is not regulated. Messages arrive just as they are sent. They are read when the user chooses to access them. Messages can be ignored, and there is no way for the sender to prove whether or not the recipient intentionally ignored a message or genuinely didn’t receive it. In hostile divorce cases, this may be a problem, especially if one party does not want the divorce to proceed. This can lengthen the process and make it more complicated. Additionally, some people lose account information, abandon their social media account, and create a new one. How would a server know which account is active? Even if a person has a single social media account, the question lies in how often they use it. According to our research, there have only been a handful of cases since 2011 that allowed service of process via social media. 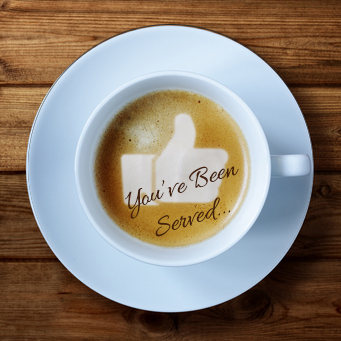 In almost all of those cases, traditional means of service had failed, and service by social media was a last-ditch effort to get the individual served. As long as [service by Facebook] remains a “last resort” option, I don’t have a problem with it. Social media has permeated our everyday lives, the professional scene, and in business. You may have a Facebook page for your business and receive business requests through it. Should it be legal to serve divorce papers on Facebook?, recent article published in The American Genius, a website devoted to chronicling sweeping changes in industries as a result of online social interactions, bravely predicted that social media will be a normalized extension of civil process service. With our research, it doesn’t appear that it is possible for service by social media to be a primary method of service, but certainly a substitute. So should it be deemed legally acceptable throughout the U.S. as a method of substitute service? Weigh in with your opinions in the comments.